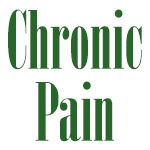 Chronic Pain : Skip the Steroids for Shoulder Pain? TUESDAY, Aug. 5, 2014 (HealthDay News) -- For relief of shoulder pain, physical therapy and steroid shots provide similar results, a new study finds. Researchers compared the two nonsurgical approaches in a group of 100-plus adults suffering from shoulder pain caused by rotator cuff problems, tendinitis or bursitis. "Whether you had a steroid injection or physical therapy, the improvement in each group was the same," said lead researcher Daniel Rhon, from the Center for the Intrepid at Brooke Army Medical Center at Fort Sam Houston, Texas. "It was also a rather large improvement, about 50 percent, and this improvement was maintained for at least one year," he said. But the group that received injections used more health care services and had significantly more shoulder-related doctor visits during the year of the study, Rhon said. "Additional visits to your primary care provider may indicate that you had a persistent problem and were seeking further follow-up," he said. In addition, 20 percent of those who got injections ended up going to physical therapy anyway, and about 40 percent who got shots needed more than one injection, Rhon said. "While we don't know for sure, needing another injection would likely indicate that they still had persistent pain, especially because additional injections were optional," he said. About one in five in the physical therapy group also got an injection during the year of follow-up, Rhon said. The findings should reassure patients who prefer to avoid injections. "Some patients really do not like injections, so physical therapy may be a great and effective option," Rhon said. The report was published Aug. 4 in the Annals of Internal Medicine. Dr. Michael Hausman, a professor of orthopedic surgery at Mount Sinai Medical Center in New York City, said the findings "seem contradictory to my experience in practice." Most of his patients who opt for physical therapy say their pain got worse with therapy, Hausman said. "Probably the reason for that was that the therapy involves strengthening exercises, so patients are stressing the tendons that are damaged," he explained. "It's not surprising that the therapy would aggravate the symptoms." Hausman thinks that steroid injections work and should be part of treatment if physical therapy isn't enough. "If the joint is stiff, you should do stretching exercises to restore full motion. You should avoid exercises that put a strain on the rotator cuff tendon," he said. "If the symptoms persist and limit activity, then I would recommend a steroid injection with a maximum of two injections." Shoulder pain is a very common condition, and treatment decisions aren't uniform, said Dr. Michael Mizhiritsky, a physiatrist at Lenox Hill Hospital in New York City. "An accurate diagnosis needs to be established before initiating treatment. An experienced physician needs to evaluate a patient and consider diagnostic tests, such as X-ray and MRI," he said. "Only then should treatment begin." Treatment should include physical therapy, Mizhiritsky said. "Steroid injections should be considered either before starting physical therapy or anytime there is no significant timely improvement, and a home exercise program needs to be followed," he added. For the study, Rhon's team randomly assigned 104 patients with shoulder pain between the ages of 18 and 65 to receive steroid injections or six sessions of physical therapy over six weeks. Participants reported on their pain throughout the study. During the year of the study, those receiving steroids could have as many as three injections. Physical therapy included a combination of joint and soft-tissue manipulations, stretches, muscle contraction-relaxation techniques and exercises to promote movement in the shoulder, chest or neck. These patients also were given exercises they could do at home that reinforced the therapy.